Back by popular demand, and in another exclusive offer, Rewarding Times has teamed up again with the Huggard Family and the Lake Hotel with another fabulous short break for 2 people. Relax in a beautifully appointed Deluxe lake view room with one of the most spectacular views in Kerry. Enjoy two night’s accommodation with breakfast included each morning and a 3 course table d’hote dinner on one evening in the elegant 2 AA Rosette winning Castlelough Restaurant. Also included in your offer is a complimentary print of the Lakes of Killarney as seen from the hotel and deluxe chocolates in room on arrival. Also an additional amenity available only to Rewarding Times clients of a complimentary late checkout . Total package price for two of €298, total saving of €123. At The Lake Hotel we pride ourselves on offering a truly Irish welcome, a tradition that has been fine-tuned over many years by the hotel owners, the Huggard family. As a family owned and family run hotel, ensuring that all guests are comfortable and happy is our business. Since 1820 guests have been coming to stay in the hotel to enjoy its unique vista and although additions have been made over the years, the hotel retains its old world charm and elegance whilst offering all modern comforts. Awaken with breakfast in the elegant dining room and observe the wild deer stroll across the lawn, unwind over coffee in the Piano Lounge and absorb the peace and tranquillity imposed by the presence of the lakes. Wander down the pathway to the ancient castle ruins and be surrounded by the freshest of air and a landscape that is untouched by centuries of visitors and admirers. As the light fades and colours change, enjoy an aperitif in the Devil’s Punch Bowl Bar before tasting the finest of Irish food in the Castlelough Restaurant and reflecting on the abundance of natural beauty in this part of the world. 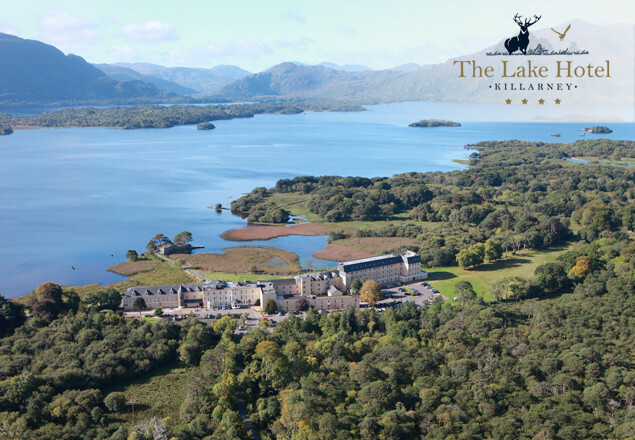 There is something for everyone staying with us at The Lake Hotel, with Killarney town just 2 km away, the Killarney National Park adjacent to the property, several championship golf courses within a 5 mile radius and wild deer and eagles residing on our grounds. Equally this is the ideal setting for an essential escape from daily life with nothing to distract you from the panoramas outside the hotel windows. Valid 7 days a week with limited availability weekends. Vouchers are not valid for use from 17-18 March inclusive, 14-17 April & 28-30 April inclusive. Multiple purchases are possible but a maximum of two rooms can be booked for any given date. Please note - your voucher must be used by 12th May 2017. This redemption date is firm. No correspondence will be entered into regarding late redemption of your voucher. Children up to the age of 3 years old are free with this offer.